Organic Wheat Grass: Wheat Grass is an Amazing SUPERFOOD that is loaded with essential vitamins and minerals (including thirteen essential ones and dozens of trace elements and enzymes). Wheat grass contains ALL minerals known to man (Iron, zinc, magnesium, potassium, phosphorus, calcium, sodium and selenium are all present in wheat grass in at least trace amounts). Plus: Vitamins A, B-complex, C, E, I & K.
Chlorophyll creates a highly oxygenated environment in your body which helps increase Alkaline pH levels and helps eliminate Acidosis (a common problem in our society due to an overly acidic diet and environmental carcinogens). Antioxidants such as flavonoids and Phenolic Acid help eliminate toxins and increases immunity and energy. 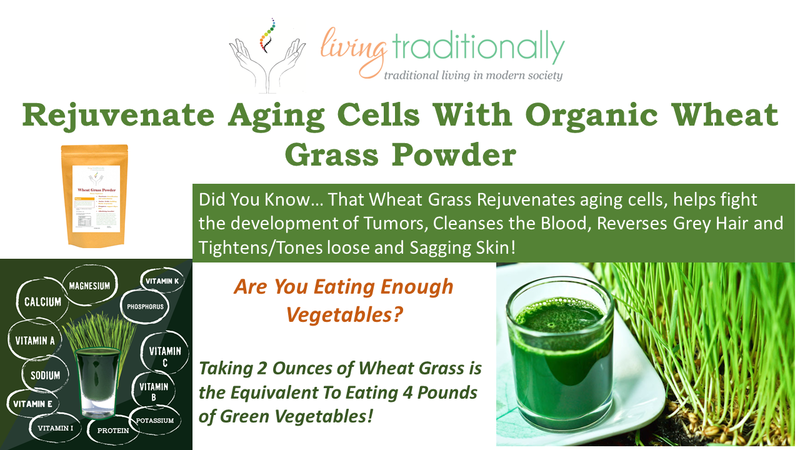 Wheat grass is a natural liver cleanser and blood strengthener. 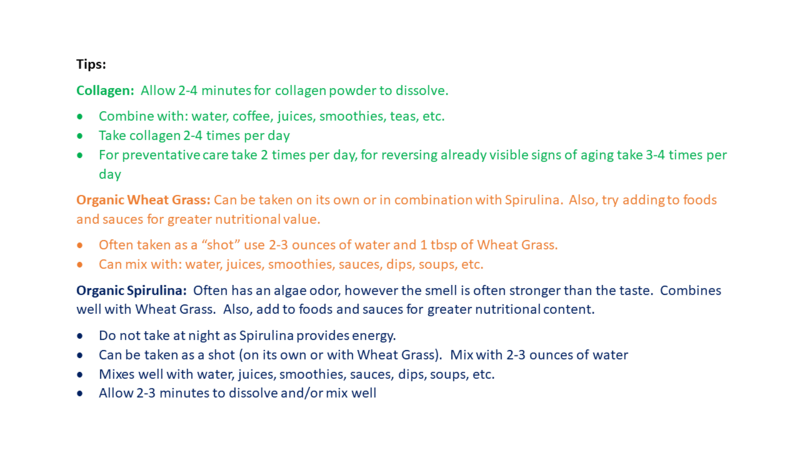 Organic Spirulina Powder: It was Spirulina that was called the “best food of the future” by the World Food Conference. But is was when NASA added Spirulina to the Astronauts diet that put Spirulina on the map. Since then, there have been many studies demonstrating the wide range of healthy properties this supplement provides. 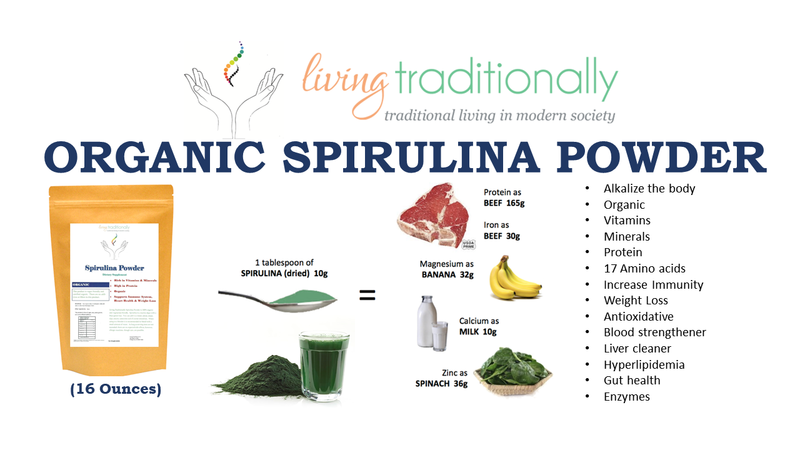 Livingtraditionally Spirulina is a great source of highly usable and digestible Proteins and 9 essential Amino Acids. Good for vegetarians, vegans and athletes (increases endurance and muscle strength). Provides the essential fatty acid GLA. High in Omega’s 3, 6, and 9! Spirulina Powder contains very high levels of B vitamins (including B1, B2 and B9) also vitamins C, D and E. Contains a very absorb-able form of Iron (great for vegetarians and vegans). Spirulina helps treat Candida and Yeast infections. Candida is a hallmark of autoimmune disease. Helps prevent leaky gut syndrome. Reduces acidity in the gut and helps lower risk of infection. Increases immunity and energy levels! Non-GMO Hydrolyzed Bovine Collagen Powder: Directly attack those wrinkles with Collagen powder! Collagen supports the growth and development of collagen fibers (which provide support and structure for your face and body). 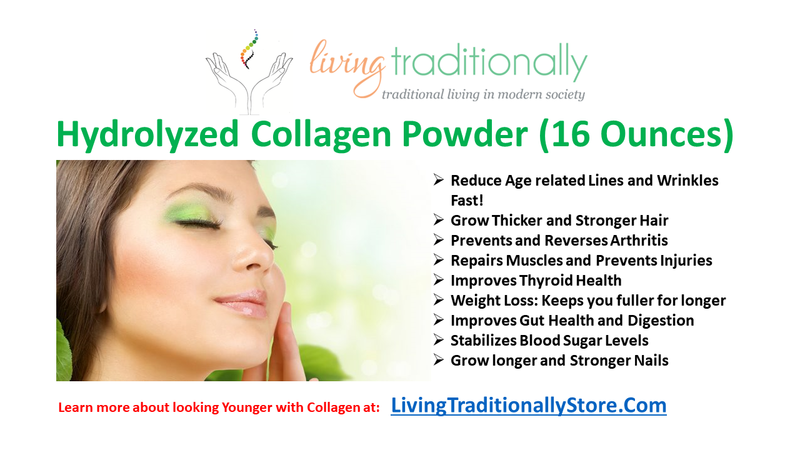 Livingtraditionally Collagen Powder provides small chain peptides, proteins, amino acids and proline which helps your body naturally develop and preserve skin tone and structure. Supports strong hair: Strengthen and support new hair growth while making mature hair look radiant and healthy. We know you will notice the difference with stronger and fuller hair. Strengthen Nails: Tired of breaking your nails just after a manicure? Want to stop using fake nails? Collagen will strengthen and induce fast growing nails. Support Gut Health: Prevent leaky gut syndrome and improve digestion and nutrient absorption. Makes Wrinkles Disappear: Replace lost collagen fibers with hydrolyzed collagen supplements. The Livingtraditionally Super Pack is a non-invasive and natural way to achieve your anti-aging goals. 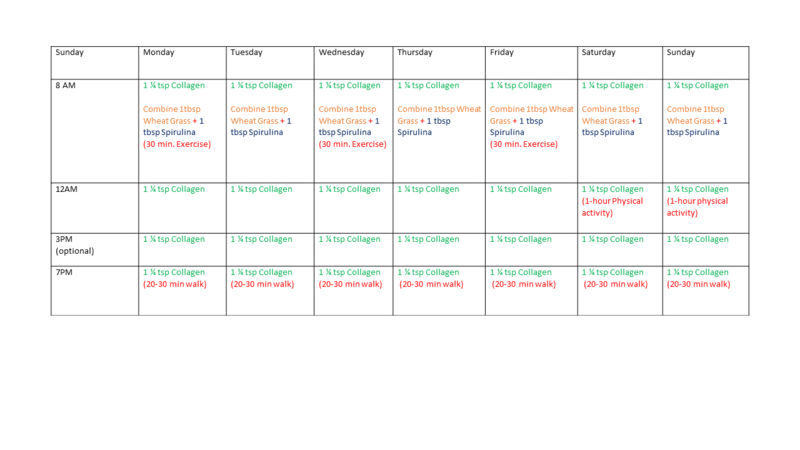 The below dietary supplement schedule is designed for you to get the best results while not invading your body with foreign chemicals or products (such as Injections or surgery). It is also designed to easily fit into your daily routine. While the below is a guide, you may adjust some elements to better suit your needs and/or lifestyle. I expected the products to taste horrible but they didn’t. Makes it so much easier to use them daily. I’ve noticed a difference since I’ve started using the products for the past week. Will definitely purchase again. The Spirulina and Wheat Grass powders give me much energy in a smoothie with organic fruit and an avocado. The collagen caused constipation. Oh well, 2 out of 3 is acceptable. Great, quality products. Notice a definite improvement in energy, skin health, and MS symptoms. Will definitely continue to buy. Now have all three products and love them. Some I haven't used long enough to say. I have been a herb powder user for years. Compared to other brands, LT surpasses them all ! The best quality EVER ! We need more options and choices !